What is a split primary palette? I'm looking at building out a gouache palette and I came across the term "split primary" palette. What is that and why would I want to have that? A split primary color palette is a slight derivation of the artist primary color palette, which is composed of red, yellow and blue. The split comes from taking those three colors and splitting them into warm and cool versions. If you try mixing across these lines, such as Warm Red + Warm Blue, the pigment interaction can cause the colors to become washed out or muddy. The same is true with your Secondaries. Don't mix your Purple with your Cool Blue. Sticking to the formula above and only mixing colors in the same 1/3rd sections keeps colors looking bright and intense. Aside from more vibrant colors, this type of palette allows you to more easily mix a full spectrum of colors. 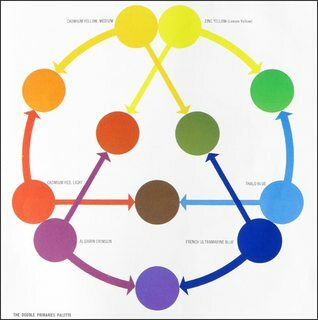 This is in part because the Cool Blue, Cool Red, and Cool Yellow are closer in value to Cyan, Magenta, and Yellow, the Subtractive Primaries (as seen in CMYK color standards). 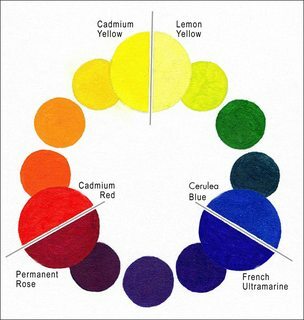 CMYK works better for mixing paint, because the paint gets its colors from pigment which "absorbs" light (and only reflects back the wavelength we perceive). The absorption is where the term subtractive comes into play. Warm Red reflects back Red, which is Magenta + Yellow, meaning it absorbs Cyan. Warm Blue reflects back something closer to Cyan, which means it absorbs Magenta + Yellow. Notice how the Cool Yellow and Cool Red mix to make something closer to Red? And then mixing that with the Cool Blue leads to brown (pretty dark here, but compare it to the black center in the CMY set). The additional benefit to using this type of palette is that it helps train you to naturally understand how mixing RBY/CMY works as you practice, while helping you avoid those mixes that lead to dim, muddied colors. As a plus, it could also save you some money by avoiding wasted paint! A split primary palette is one that consists of two shades of each primary color: a "warm" one and a "cool" one. The idea is to produce mixtures that are less muddy by reducing contamination from the third primary color. For example, if you want to mix a green that doesn't tend towards brown, you choose a slightly-greenish blue and a slightly-greenish yellow, so that the mixture has very little red. In practice, at least in my experience, no matter how carefully you choose your primary colors, a mixed green is never going to be as vibrant as an actual green pigment. Purple is marginally easier to mix, but you're still better off with a purple pigment. Orange is really the only color that can be mixed reliably. (Well, that and brown, but even with brown it can be hard to achieve just the right shade.) That said, for most people a split-primary palette is probably more cost-effective than a single-primaries-plus-single-secondaries one, because few people paint in only primaries and secondaries1 -- you always want slightly-this or slightly-that shades. Yes, you also have black and white at your disposal, but that gets you pastels and mud, not the gradients you want. How to decrease the intensity of the colors or how to make colors less obtrusive? What color scheme does the Spongebob character use? Can I be a painter as colorblind? What are the differences between different black oil paints?